Stunning Forest Lake Home- Hot Tub Bubbling,Enjoy Spring & Summer Activities! 4 Bdrm, 2 BA, Hot Tub, Firepit, Boats,Bikes, Ping Pong,Crystal Clear Lake, Fun! Inquire today for a Memorable Lakefront Vacation in the Monadnock Region of Southwest NH. Just 10 mi south of Keene NH. Inquire or book today for Springtime Fun or a Summer Sat to Sat weeks, which fill up early!. A Stunning Lakefront home on crystal clear,sandy bottomed, 110 acre Forest Lake at the junction of NH,VT,& MA will be your long awaited retreat in the whispering pines, shimmering lakes, and beautiful foliage of New Hampshire. Bring the kids & dogs or just enjoy by yourselves. The Great room with 25' high natural pine cathedral ceiling, skylights, entertainment center and fireplace is comfortably, casually, and uniquely furnished. Winter Time is terrific for a relaxing break from the Holiday season or go cross country skiing, snowshoeing or hiking from our door, then enjoy our wood or pellet stove or just turn on the modern forced air heat. It looks out over the pristine Forest Lake that lends itself to a memorable vacation with family and friends. A fully equipped gourmet kitchen that incorporates a Jennair oven/range/grill, refrigerator/icemaker and dishwasher with ALL utensils, equipment, spices, condiments, baking supplies, Weber BBQs both Gas & Charcoal will make it difficult to try the eclectic restaurants in Keene, New Hampshire or historic Brattleboro, Vermont nearby. The Four Bedrooms are 2 Queen beds, a Double, and the 4 season sun-porch with 2 single beds & Queen hide a bed (Great kid or teen suite with their own TV, VCR and DVD) and a Queen hide-a-bed in the living room and crib allow for a peaceful nights rest after sitting in the private outdoor Hot Tub overlooking Forest Lake! We do ask our guests to provide their own bed linens and towels. We have lots of pillows, quilts, blankets etc. An additional living room/ sitting area with wood stove, AC and new half bath with full size washer & dryer gives you a chance to plan your day fishing,which is superb because the state stocks Brown & Rainbow trout to complement the numerous Large mouths, Perch, and Horned Pout. Enjoy swimming off the 150 square foot floating dock, using our big canoe,3 kayaks, 4 person paddle boat, rafts on the lake, cross country or downhill skiing, snowmobiling on marked trails, antiquing and shopping in sales tax free NH, playing golf, hiking, biking, leaf-peeping, or attending one of the many auctions, flea markets, concerts, shows or festivals in the area. For a little exercise and a 100 mile view, climb Mt Monadnock, the most climbed Mtn in the world, and only 18 miles from the house. On a clear day you can see Boston, a 100 miles away! Horses and trail rides are less than a mile away and afterwards, rest those weary muscles in the Hot Tub with the Sunsets going right into shimmering Forest Lake and the crackling campfire right in view. Winter brings cross country skiing right from the door with our 10 sets of skis, 12 sizes of boots & lots of skates,snowshoes, hockey sticks, snow shoes,Ice fishing 'jigs' and "The Wooden Zamboni" to make a nice rink for your use! Big time downhill skiing within an hour, snowmobiling on marked trails,ice skating, sledding, ice fishing or just relaxing around the wood stove, propane fireplace, or pellet stove. Maybe best of all, just grab a book,snuggle in a chair by the fire,or on one of the 3 outdoor decks and just let your cares drift away as the sun slowly sets out over the lake! Also check out our other home on Rockwood Pond in Fitzwilliam, NH VRBO/181030. Make sure to look at the unedited Guest Reviews just below to see what our previous guests thoughts were! No property in New Hampshire has more positive reviews! We used to run a Country Inn and Spa in Canada. While we certainly enjoy our homes when we can, we really have fun providing an enjoyable and relaxing time for our guests, who do seem to return year after year. We'd like you to be one of them! The town of Keene, NH, 9 miles north has a wide and constant variety of things to do, with it's 3 universities and very active merchants assoc. The main downtown, with 60 shops & restaurants, with no national chains is very unique. There are all the 'Big Box' stores on the outskirts of Keene. Funky Brattleboro, VT is only 14 quick highway miles away. All of that is contingent on being able to pull yourself away from all the boats, games, skis that we have at the house! Forest Lake is very protected from prevailing winds, so it warms quickly in the Spring and freezes quickly in the Winter. As a mostly summer seasonal lake, from early fall to late Spring, you own the lake! We have all the boats and sports equipment for a fun filled vacation any time of the year! We always have a current list of things going on in the area, restaurant menus , maps, hiking guides etc. Not far to Mt Monadnock- The most climbed Mtn in the world! Great Western facing view- Incredible Sunsets! Either the Decks or The Hot Tub! 100' of private lakefront with gradual sandy entry into the water. cross country ski trails across street or just tool around the lake! 100' of private lakefront with gradual sandy entry into the water. 25 foot stationary dock attached to 150 sq ft floating dock. Swim platform out about 50 feet. parking for 6 cars in level area. Some equipment, but hike the trails that start 200 yards from the house , or swim across the lake! Cathedral Ceiling with glass wall overlooking the Lake- Incredible Sunsets! (2) with Icemaker.Extra Ref/Freezer in basement with additional gas stove and sink in basement rec room. Spices, flour, cooking oil, condiments like ketchup, mustard, mayo , bbq sauce etc. Lots of glasses, dishes, pots, pans and enough cooking utensils to put on a full Thanksgiving dinner! Controllable speakers in each room and outside. Plug setup to use your smartphone THRU ENTIRE HOUSE ! Air Hockey and Ping Pong Table, BOX OF KOOKY HATS AND WRITE ON THE WALLS! Approx 200 Movies on DVD & VCR Current Classics and lots for kids. a number of kid, teen & adult bikes, but feel free to bring your own, great riding in the area. (2) 3 separate decks on different levels- let the kids eat on one while you enjoy another. Public tennis courts in downtown Winchester. 5 Courses within 15 miles. Off Very Private Back Deck overlooking the Lake, open late March to New Years- other winter times possible for an additional charge and dependent on weather conditions. 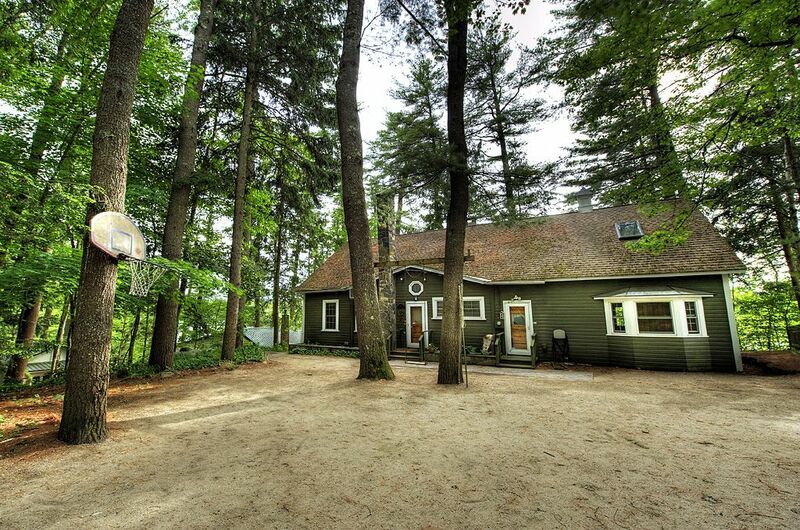 Also Check out our other home on Rockwood Pond in Fitzwilliam, NH!! VRBO #181030 with very similar amenities. Hot Tub overlooking the Lake!! Will entertain heavily discounted long term rental from Nov up to as long as the beg of June. Kids & Pets are always Welcome! Unfortunately we were unable to make the trip, Paul was very understanding. We look forward to rebooking soon! We stayed during the off season with no one around, only the geese and ducks! Beautiful view of the lake, spacious, comfortable home. Owners were friendly and available if needed. Short drive to Keene for dining or shopping. A beautiful home, filled with everything you could need to have a fun and relaxing vacation. We can't wait to stay during the summer. Stayed during the winter and the cabin was great. Had everything we needed and Paul was a very helpful host. Would love to stay again sometime. Please add 9% NH tax to all rates. NH Tax ID # 054223 No Pet charge. $95 Cleaning Fee Some Holidays and Special Events have a premium. Heavily discounted long term stays available- Please inquire! No large parties with non guests.